...As for skiing, the best lift in town is The Canyon’s 9990. At the very top of the resort, 9990 offers some hearty steep fall lines and a big north-facing slope that stays cold and dry even in the late spring. A little hard work here usually yields some powder that tourists couldn’t find. The Canyons also employs the best lift operators anywhere – this is a fact. 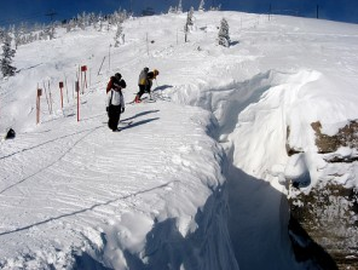 The Canyons spans 4,000 skiable acres, making it the biggest resort in Utah. The resort is quite spread out, however, and a lot of time can be wasted trying to get from one end to the other. Skiers should pick a side and mine it.